Something big happened in the year A.D. 774. Scientists studying tree rings found a sharp increase in the amount of radioactive carbon-14 recorded in the rings of ancient Japanese cedar trees between 774 and 775. Carbon-14 can be created by cosmic ray particles arriving from space, but what causes such cosmic ray increases? At first, experts were at a loss to explain the event, and the team that unearthed the tree ring data earlier this year dismissed the sun as a possible explanation. Now a new team of scientists argues that a solar flare is the most likely culprit. The sun could have released a huge and powerful blast of plasma into space called a coronal mass ejection, which, when it hit Earth, could have sparked the creation of carbon-14, suggest astrophysicists Adrian Melott of the University of Kansas and Brian Thomas of Washburn University, also in Kansas, in a paper published the Nov. 29 issue of the journal Nature. Carbon-14 is a variant of the normal form of carbon (carbon-12) that is common on Earth and throughout the universe. 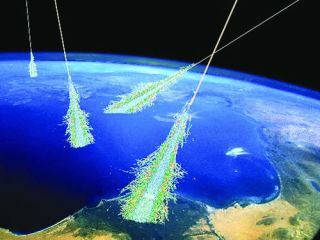 When cosmic ray particles hit Earth's atmosphere, they can produce showers of particles such as neutrons. Some of these neutrons, in turn, hit the nitrogen nuclei that are rife in the atmosphere, and a chemical reaction occurs that transforms the nitrogen into carbon-14. This carbon variant is unstable and decays with a half-life of about 5,730 years (meaning half of any amount of carbon-14 will be gone in that time). For this reason, it's a useful date marker: A tree, for example, will stop absorbing carbon once it dies, so the amount of carbon-14 left in it is a reliable indicator of how old it is. It had been widely known that a jump in carbon-14 occurred in the eighth century, but researchers first pinpointed this rise and fall on a year-to-year basis by looking at tree rings in a paper by Fusa Miyake of Japan's Nagoya University and colleagues, published in the June 14 issue of Nature. "They found that whatever made that carbon-14 bump happened really fast, and took less than one year, which called out for some really major, powerful event," Melott told SPACE.com. The Japanese researchers considered that it might be a solar flare, but calculated that it would have had to have been thousands of times more powerful than the greatest one ever known, which made such a scenario unlikely. Now, in a new calculation, Melott and Thomas say a solar flare is a reasonable explanation. "Their mistake was, they assumed that the energy shot out by the sun in one of these coronal mass ejections goes out in all directions, like the light from a light bulb, but in fact it's kind of shot out in blobs," Melott said. Still, the scientists can't completely rule out other explanations, such as the possibility of a supernova star explosion, or a special type of supernova called a gamma-ray burst. Both could have created a strong wave of cosmic rays as well. However, a nearby supernova would have been extremely bright, and likely noticed by the residents of Earth at the time, who largely noted nothing unusual. A gamma-ray burst, which condenses much of the radiation released from a supernova into two strong beams, could conceivably have packed the punch necessary for the carbon-14 spike, but Melott says this scenario is still less likely than a strong solar flare. Miyake did not respond to a request for comment, but Melott said the Japanese team "didn't argue" with the new calculation. Interestingly, while a strong sun flare would have had little effect on people in 774, a similar event could wreak significant havoc today. That's because our modern technology, including satellites, radio transmissions and power grids, could be seriously hampered by the particles sweeping in from a coronal mass ejection. "We're not prepared for this sort of thing," Melott said. "It needs a lot more work to really check it out. And we need better warning if something like this is on the way."